Borla Performance Muffler - Boomer UNIVERSAL - Lightning Motorsports - Selling Speed since 1996 ! BORLA Boomers are full-blown, high-tech, dyno and race-proven mufflers for the street or track. 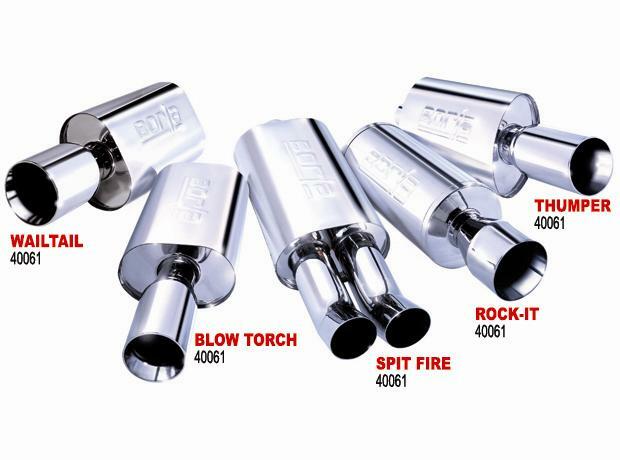 These eye-popping, fully polished mufflers utilize BORLA’s patented race-winning technology. They boost horsepower 7% – 10% while adding head-turning sound. Available in a variety of universal-fit styles, BORLA Boomers are made of aircraft-quality high quality austenitic stainless steel and include a Million Mile Warranty.